"I'm afraid to eat before I exercise ... I might get a side stitch." "I always carry toilet paper with me when I go on a long run." "How can I change my sports diet to so I don't need pit stops..???" Little is more frustrating to a competitive athlete than to be well trained for an event and then get sidelined with a side stitch or diarrhea. Yes, the sports diet that's intended to enhance your performance can also bring you to a screeching halt! Sound familiar? Transit troubles and gastrointestinal (GI) concerns are common among athletes, particularly those who run and jostle their intestines. An estimated 30 to 50 percent of distance runners experience exercise-related intestinal problems, with women experiencing more problems than do men. If you are among the many active people who fear side stitches, loose stools, and GI distress, keep reading. The goal of this article is to offer some information and advice that can help you manage, if not reduce, your transit troubles. A side stitch--that stabbing pain in your gut that can bring you to a stand-still--is familiar to about 60 percent of athletes. Because getting attacked by a side stitch is unpredictable (that is, one day you might get one but the next day you don't), they are hard to research. The available data suggests they commonly occur in the same spot: on the upper right side of the abdomen where the liver is attached to the diaphragm by two ligaments. 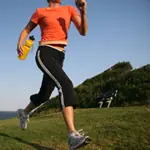 While we aren't 100 percent certain what causes a side stitch, the prevailing theory is exercise creates stress on the ligaments that connect the liver to the diaphragm. Stitches can be provoked by a heavy dose of pre-exercise food/fluids, minimal training and inadequate pre-exercise warm-up. Wearing a tight belt can help reduce organ jostling and reduce the symptoms. You could also record your food and fluid intake to try to detect triggers (too much pre-exercise water? too large a meal?). With repeated dietary tweaks, you can hopefully discover a tolerable portion of pre-exercise fuel. Marathoner Bill Rodgers may have been right when he commented more marathons are won or lost at the porta-toilets than they are at the dinner table. Diarrhea is a major concern for many athletes, particularly those who run--and understandably so. Running jostles the intestines, reduces blood flow to the intestines as the body sends more blood to the exercising muscles, stimulates changes in intestinal hormones that hasten transit time, alters absorption rate, and contributes to dehydration-based diarrhea.